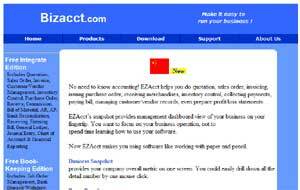 What is FINANCIAL ACCOUNTING FREEWARE ? : Financial Accounting Free Software are such Freewares for any Company who want to maintain their Company Accounts and Taxation details etc on Computerized Financial accounting Software. This Section contains Free Accounting Software Tools from India and other companies to give you complete accounts management solutions with ledger Books / Cash Book / Debit / Credit entry and all fully functional Business accounting Tools as free download. It also handles data export and backup and restore for financial data analysis and company data security. 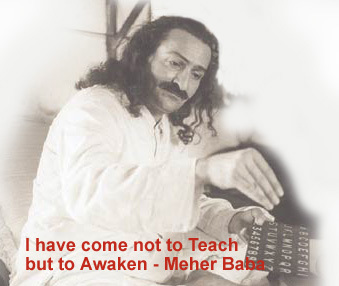 These software are excellent for bookkeeping, accounting services, Open Accounts , Financial Processing accounting software, cost Accounting, database accounting software, business accounting software, adaptable accounting, accounting systems, financial accounting, Indian accounts software, Indian accounting software, accounting programs, tax preparation, tax planning, financial accounting with VAT, software for VAT, accounting software in India, free accounting software. Long Installation time Approx 1 Hour. 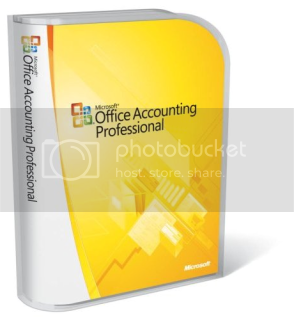 Microsoft Office Accounting Express 2007 is an essential tool for managing your business finances. Whether you’re a small or home-based business, you can use this accounting program to make pen and paper-based tasks a thing of the past. With the familiar look and feel of Microsoft Office, Office Accounting Express 2007 helps you get organized, save time and sell online. USBMoney is a simple multi currency personal finance program designed to keep all financial details in one place. Transactions can be either entered manually or imported via downloaded CSV/QIF (comma separated value/quicken interchange format) files or a combination of both approaches. Easy Cash Manager is a simple Cash book-keeping program for Windows. You can use the program to keep records of your incomes and expenses. The versatility is quite useful, because you have a lot of functionality in one single program. You can add / delete your Incomes and Expenses. Create categories and sub-categories, do sorting, change currency Symbols and best of all Export the data in CSV or import from CSV. AQURA – Lite ! is a Freeware double entry financial accounting freeware best suited for all financial accounting requirements of companies. It has support for inventory. It is very fast and robust and small in size. It has special protection for power failure. AQURA – Lite ! has drilldown browsers which can be easily customized. AQURA – Lite ! also has many reports with various formats of balance sheets, profit and loss account, ledgers, registers. It can take the backup of data and also restore from data. 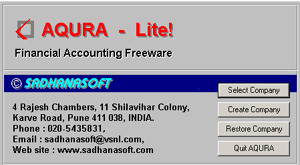 This is one of the Best Freeware Business Financial Accounting Freeware Software from India. BusyLite 1.0 is a DOS-based single-user business accounting software covering Financial Accounting, Inventory Management, Invoicing and Sales Tax Reports. Targeted at small businesses and professionals, the same can be upgraded to standard Busy 2.7 (DOS-based), should the business needs of the user grow and demand a more powerful business software. The data entered in BusyLite 1.0 will be automatically upgraded to Busy 2.7. 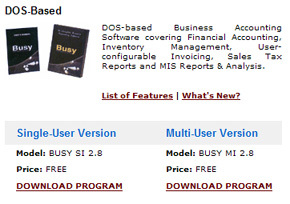 Busy UL 3.0 is a Windows-based single-user business accounting software covering Financial Accounting, Multi-location Inventory Management, Invoicing and Sales Tax Reports. Targeted at small businesses and professionals, the same can be upgraded to standard Busy 3.0 (Windows-based), should the business needs of the user grow and demand a more powerful business software. The data entered in Busy UL 3.0 will be automatically upgraded to Busy 3.0. Money Manager© is a free, easy-to-use personal finance software. It primarily helps organize one’s finances and keeps track of where, when and how the money goes. It is also a great tool to get a bird’s eye view of your financial worth. Here’s what a reviewer had to say: “Money Manager is an easy to use software to manage your personal finances. You can keep track of multiple accounts, manage recurring or upcoming bills and payees, reconcile with your bank statement and more. The program supports checking accounts, savings and credit card accounts, as well as Fixed Deposit and Portfolio accounts. The Outlook-style interface provides an overview for all your accounts and total balance. You can transfer money between account, create custom categories to organize your income/expenses and more. requires .NET support and may not work efficiently if the support is not properly installed. Free Accounting Tools with Business Accounting Software and Accounting Freeware Freewares / Personal Bank Accounts Managers, Money Managers , Credit Debit Account Managers for Small Medium Company and also financial Processing accounting software, cost Accounting, database accounting software, with business accounting software, Free adaptable accounting, accounting systems, and tools financial accounting, Indian language accounts software, Indian accounting software & accounting programs, Notes on tax preparation, tax planning, financial accounting with VAT, software for VAT, accounting software in India, free accounting software.